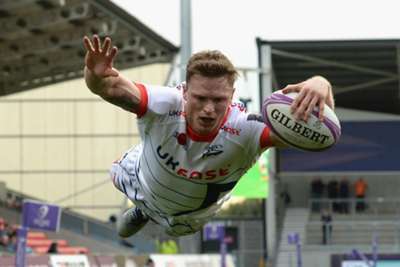 Chris Ashton marked his competitive Sale Sharks debut with a sensational hat-trick in a 34-13 beating of Connacht in the European Challenge Cup. The England winger has been banned for the past seven weeks due to a tip-tackle in pre-season, but made up for lost time in a victory that leaves Sale top of Pool 3. Ashton raced over for his first shortly before half-time to level the scores at 13-13 and crossed twice more after Josh Beaumont had dotted down to put Sale ahead. The other fixture in the pool saw Bordeaux-Begles play out a 25-25 draw at home to Perpignan, the hosts levelling things up in the closing stages through Jules Gimbert's try but missing the follow-up conversion. Worcester Warriors held off a valiant fightback from Ospreys to make it two wins from two in Pool 2. Jamie Shillcock, Wynand Olivier and Jack Singleton tries helped Worcester into a 21-0 half-time lead, and six points from the former's boot after the break proved decisive as Cory Allen's brace either side of Rob McCusker's score brought Ospreys back into the game. Top 14 high-fliers Stade Francais are rock bottom of the pool after surprisingly going down 21-15 at domestic rivals Pau. Clermont Auvergne top Pool One thanks to a 70-12 battering of Timisoara Saracens - Apisai Naqalevu and Setariki Tuicuvu each scoring hat-tricks – and Zebre earned a potentially crucial 20-17 win at home to Bristol in Pool 4. Rounding off the action, Harlequins slipped to a 19-13 loss at Grenoble in Pool 5, despite Marcus Smith putting up all of the visitors' points.